University of Hawaii Press, 277 pp. This article was first published in the October 11, 2012 issue of The New York Review of Books. A little over a year ago, I went with the Chinese writer Yu Hua to his hometown of Hangzhou, some one hundred miles southwest of Shanghai, and realized that his bawdy books might not be purely fictional; their characters and situations seemed to follow him around in real life too. We stayed in a villa in a secluded development built on part of a wetlands park. The string of houses, bridges, and canals was surrounded by high walls and walkie-talkie-wielding guards. Yu’s neighbors were film producers, directors, artists, writers, and government officials—all beneficiaries of a city-run company that owned the properties and lent them out to anyone it figured might lend luster to Hangzhou, do something artistic, or simply had the pull to live in a luxury development. Yu is one of China’s most famous writers and even though his relationship to the city is tenuous—he was born in Hangzhou but left as an infant for a small town and now lives in Beijing—officials hoped he’d give their city some cachet. Over the next few days, the villa was the setting for a series of meals, one raunchier than the next. The high point was a boozy lunch where the head of the local writer’s association ogled the legs of the deputy head of propaganda, while a paunchy singer for the People’s Liberation Army showed off a “talented young lady” he had taken under his wing. Later, a Party secretary arrived with a suitcase full of French wine and an enormous celadon vase from the onetime imperial kilns of Jingdezhen—the sort of trophy that governments in China fob off on famous visitors and hotel lobbies. When everyone was suitably drunk, Yu quieted the room with an announcement. “We were just at West Lake,” he said, referring to the city’s most famous tourist site. 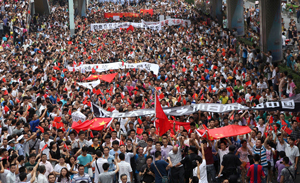 “I haven’t seen so many people in one place since June 4”—the 1989 massacre of antigovernment protesters in Beijing. The feeling might have been mutual. In a sense, the visitors had gotten what they’d come for—a chance to meet the famous man and, in the privacy of dinner, congratulate themselves on being so open-minded that they could laugh along with Yu as he criticized the Communist Party. But like many intellectuals in China, Yu is being forced into an increasingly uncomfortable situation. He is unwilling to break with China and still takes pride in living here, but the stagnant political climate—including tighter controls over culture and the media—has pushed him into riskier views at odds with his position as one of the country’s top establishment writers. Over the past two decades, the fifty-two-year-old Yu has emerged as one of China’s most popular authors. His best-known work, the 1993 novel To Live, recounts in parable-like form the story of a peasant who endures China’s civil war and then the famines and political campaigns of early Communist rule. His main quality is his sheer will to live, making the novel a bleak commentary on recent Chinese history. The novel sold more than 200,000 copies in 2011 in China, according to his publisher, the Writers Publishing House. His next novel, Chronicle of a Blood Merchant, tells the story of man who almost kills himself by selling blood to pay for his family’s survival in the Mao period; it is another book that most educated Chinese know and have read. In 2005 and 2006, he published his riskiest novel, the best-selling Brothers, a picaresque story of two stepbrothers whose lives span the latter half of the Maoist period and today’s reform era. The underlying message is that today’s naked capitalism has its roots in the brutality of early Communist rule. It can still be found on bookstands selling pirated books—high praise in a country with a short attention span. Like any talented novelist in China, Yu has always walked a fine line: To Live was made into an acclaimed movie by the Chinese director Zhang Yimou but it was banned in China, even though Zhang toned down Yu’s most caustic criticisms. (In the most notorious scene in the novel, the hero’s son has his blood drained by a provincial doctor eager to save the life of a top official; the movie makes his death an accident.) More recently, Brothers caused critics in China to object that the evil brother was successful while the good brother lost out—hardly the message that China’s cultural bureaucrats want. Both, however, were published and widely read. The essays are strongest when they tell Yu’s own story of becoming a writer. Born in 1960, he was six when the Cultural Revolution started, and in one of the essays, “Reading,” he describes how he first came upon novels. In the 1970s they were forbidden, but he and a friend managed to borrow for twenty-four hours The Lady of the Camellias,a romantic novel by Alexandre Dumas that another student had copied out by hand. The two spent a feverish night making their own copy, splitting the work in half. After they returned the original and sat down to read the other’s copy, they realized that they had written so quickly that they couldn’t read each other’s handwriting. By a streetlight, they read the novel to each other, gasping in pleasure at the romance and tragedy of the courtesan who dies of tuberculosis after being forced to abandon her true love. I had seen him in the street just a few hours before. Blood was trickling down his forehead, and he was walking with a limp. In the failing light of that late afternoon, his right hand rested on his son’s scrawny shoulders, and as he talked to the boy, he wore a smile of seeming nonchalance. This violence has marked Yu’s writing career. In the 1980s his short stories (many of which are found in the collection The Past and the Punishments) were so violent that almost every character seemed to die an unnatural death. During this phase, he writes in China in Ten Words, he was plagued almost every night by nightmares, until he dreamed of his own death. That helped him recover a suppressed memory of having witnessed at close range an execution during the Cultural Revolution—he recalls in vivid detail how the victim’s head was blown open by the bullet, a gruesome image but one that finally allows him to tame the past. Although unarmed, they stood steadfast, confident that with their bodies alone they could block soldiers and ward off tanks. Packed together, they gave off a blast of heat, as though every one of them was a blazing torch. This, he says, is the true meaning of the word “people,” a word the Communist Party once used to describe the backbone of its support but that today is rarely heard in public discourse. Instead, scholars and officials whisper worriedly of rural unrest and other signs of a people who remain discontent. Yu then jumps to the present to talk about the notorious chengguan, a government agency that ostensibly enforces city rules (parking, vendor licenses, etc.) but has morphed into a brutish force with policing power that preys on urban migrants. Equipped with the latest riot police gear, they round up country folk at will, fine them, and send them home. For a while the Chinese press was willing to criticize the chengguan, but the subject has faded from public discussion. In “Copycat,” Yu suggests that not only are cell phones and software pirated in China; even ideas like environmentalism and political reform are circulated in tamed and tepid versions. This calls into question many major government projects to modernize the country, with Yu essentially saying they are a sham. The reason, he says, is that Chinese haven’t fully discussed or understood what their country is doing. Just as during the Cultural Revolution people blindly followed Mao, today they reflexively embrace market economics. “After participating in one mass movement during the Cultural Revolution, for example, we are now engaged in another: economic development.” This may be a bit simplistic, but his drawing of parallels between the past and present is rare and unwelcome to the regime. In official discourse, an entirely new historical period started in 1978 with Deng Xiaoping’s economic reforms. Yu’s willingness to challenge these conventions puts him in the company of more explicit dissidents like the conceptual artist Ai Weiwei and the writer Liao Yiwu. Yu is not as provocative as either—unlike Ai, he doesn’t literally give the Communist Party the finger, and unlike Liao he didn’t write what amounts to a howl at the Tiananmen Square massacre. Both men are on the government’s blacklist and Liao last year fled into exile in Germany. Earlier this year, the essayist and Christian activist Yu Jie chose a similar path, emigrating with this family after being jailed. But in publishing China in Ten Words abroad, Yu has made a similar decision to bypass domestic censorship and aim his work at a foreign audience. He hasn’t gone quite as far as Ai, who relies on Western curators and buyers for his shows and sales, or Liao, who hasn’t been able to publish a work in China in fifteen years. But the new book is a clear break from his string of domestic best sellers. The gap between what can and can’t be published in China can be measured by another book he published there last autumn, Yu Hua @. The book is a collection of his blogs. He deals with a variety of topics, from impressions of trips abroad to comments on society. He cites the South African activist and retired bishop Desmond Tutu on the need for a country to preserve its historical memory. In another post, he blasts the powerful Ministry of Railways for covering up a horrific rail crash in July. The Chinese book, however, lacks the systematic criticism found in the English one, which is much more explicit in showing how the country is still trapped by the past. Yu Hua @ touches on this issue once in a while but doesn’t explore it nearly as fully. And needless to say it doesn’t mention the Tiananmen Square massacre. Yu’s career shows how these political and literary issues are linked. While in Hangzhou, Yu and I had a chance to talk about literature and politics, and what struck me most was a comment he made on criticism. What China most lacked, he said, was publications that would help create great literature: the journals, reviews, and magazines where young writers can get a start and receive honest criticism. In China, literary journals are either politicized or open to bidding, with favorable reviews bought by authors or their publishers. This isn’t to say that all criticism in China is corrupted, but much of it is, stifling the honest give-and-take that might encourage the creation of genuinely superior work. Most striking in Chinese literature is the lack of editing. Indeed, publishing houses rarely revise or improve on drafts; many writers send in first drafts—after all, no one who reads it will object. Some of Yu’s own works exhibit these traits; Brothers feels about one hundred pages too long and, although poignant and hilarious, it is sometimes also maudlin and full of clichés. These problems go beyond literature: Chinese artists and academics are often astonishingly prolific because they tend to churn out works. One talented Chinese artist I know regularly produces three enormous shows a year; wiser and less greedy curators and gallery owners would have advised him against this. Academics sometimes publish a book a year, many of them regurgitations of earlier work or partially plagiarized material. The concept of blind peer reviews is all but unknown. The unwillingness to criticize a “master”—whether he is an acclaimed writer, artist, or scholar—is ingrained in Chinese society. But these problems are also political. The Communist Party’s politicizing of journals and its ban on independent organizations inhibit the creation of the institutions of civil society—independent journals, professional groups, and open discussion—that are conducive to creative work. At its annual plenum in 2011, the Communist Party declared culture to be a national priority. It wants China to be more respected internationally and realizes that, for all its problems, the United States is still the culturally dominant country. The Party also knows that China must encourage the creative impulse if it is to move up the economic ladder—from being a country that produces for others and copies their products to one that makes its own global brands. That’s one reason why places like Hangzhou have been pushing creative industries, hoping to lure people like Yu to contribute. But without real reform, writers like Yu will be adornments who face the impossible decision of whether to publish at home or abroad. These dichotomies make Yu’s books more relevant than ever. His vision of a country ensnared by its past may seem of interest only to history-obsessed foreigners. But as he and many Chinese realize, it is the key to understanding the country’s stunted modernization.